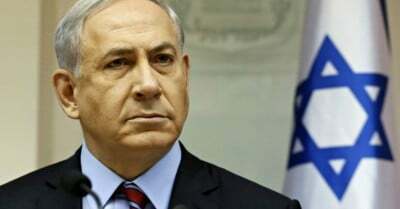 Israeli Prime Minister Binyamin Netanyahu, a notorious warmonger, serial liar and supremacist racialist who used to lead the closest thing Israel has to a fascist party until parties even more extreme got elected to parliament, is attempting to bamboozle the clueless Trump into getting on a war footing with Iran. Netanyahu’s breathless announcement that there was a potential weapons aspect to Iran’s nuclear enrichment program has been known for a decade and a half. Netanyahu even seems to have provoked the White House to issue a communique falsely stating that Iran has a weapons program presently, which it promptly had to retract. The incident is so scary because it shows how easy it is to manipulate the erratic Trump and his not-ready-for-prime-time staff. That sort of thing, David Frum said on Twitter, can cause a war. And he should know. But the retraction is incorrect, as well. Iran in the distant past had done some things that would be helpful if it had launched a full blown weapons program. It never did launch such a program. Netanyahu instanced no evidence at all that Iran is out of compliance with the 2015 deal, and UN inspectors continually have affirmed that Tehran *is* in compliance. His allegation that Iran’s recent missiles are designed to be fitted with warheads is simply false. So why try to put Iran on the front burner of American war-making? It is a desperate attempt on Netanyahu’s part to divert world attention from the ongoing Israeli Apartheid discrimination against the stateless Palestinians, which it militarily occupies (directly with jackboots and colonial settlers on the West Bank, indirectly with military encirclement and the sniping of innocent protesters in Gaza). In recent weeks, Israeli snipers have used live ammunition to kill some 40 and wound hundreds of Palestinians who were unarmed and peacefully protesting their imprisonment in the Gaza Strip (70% of their families were kicked out of their homes in Israel and now live in squalid refugee camps while European Israelis took over their houses and farmland and are living it up). The sniping victims have including children, journalists, demonstrators distant from the Israeli confinement fence, and worshipers at prayer with the mention of God on their lips. Shooting unarmed people who pose no threat is a war crime, and doing it systematically amounts to a crime against humanity. So too is the crime of Apartheid described in the Statute of Rome as a “crime against humanity,” and Israel manifestly and robustly practices Apartheid against the Palestinians under its military heel. The 2015 Joint Comprehensive Plan of Action (JCPOA) on Iran’s civilian nuclear enrichment program (to make fuel for reactors generating electricity) was designed to prevent Iran from weaponizing the program. All nuclear enrichment via centrifuges is potentially dual use. Uranium can be enriched to 5% for reactor fuel, but if scientists keep feeding it through the centrifuges they can enrich it to 95% for a bomb. The Iran deal was designed to keep Iran from making high enriched uranium (HEU). Iran accepted spot inspections by the International Atomic Energy Agency. No country under active inspections has ever developed a nuclear weapon. Iran vastly reduced the number of centrifuges it has, which means it would take at least a year or even years to make HEU, even if it could do so without the inspectors detecting the signature at the site, which it cannot. Iran discontinued and bricked in its planned heavy water reactor at Arak. Fissile material builds up on the rods in a heavy water reactor much faster than on a light water reactor, and so the heavy water ones can theoretically aid in making a bomb. Iran no longer even has a plan for a heavy water reactor. Iran destroyed its stockpile of uranium enriched to 19.5% for its medical reactor. It has no enriched uranium higher than 5%, useful for its three reactors at Bushehr. Iran benefits from nuclear energy because it burns oil for electricity generation, cutting into the money it could make from instead selling it on the open market. South Korea, Japan and France all use nuclear reactors for electricity generation just as Iran is starting to. France enriches uranium both for that purpose and to make nuclear weapons. If you don’t think Japan could construct a bomb in three weeks if it wanted to, you don’t know Japanese technology (they have a big stockpile of plutonium). So Netanyahu and the American Right should have sighed in relief, right? Remember, Netanyahu has several hundred actual real nuclear bombs that it could drop on Iran, and Iran has bupkes. Likewise the US is bristling with nuclear warheads. Iran has some old F4 jets Nixon gave them. In 2007, the National Intelligence Estimate of the CIA assessed that Iran did some experiments with military significance in 2003 but then halted them ever after. The 2011 NIE repeated the conclusion that Iran did not have a weapons program at that time and had not decided to pursue one. Our sloppy and sometimes propagandistic press keeps talking about Iran’s “nuclear weapons program,” but it is a unicorn. No such thing has ever existed per se, though the experiments and programs Iran pursued as part of its civilian energy program always had potential weapons implications, and Iranian scientists did perform some occasional experiments that might have had weapons purposes. Because nuclear enrichment is dual use, Iran until 2015 always had the option of going for broke and pursuing a bomb, using know-how gained from the civilian program. That is all the CIA was saying. It was also saying that no such decision had been taken, a conclusion echoed by Israeli politicians like Ehud Barak and by Israeli intelligence. Iran’s nuclear enrichment program has also always probably been intended to have deterrent effects against anyone thinking of doing to the country what Bush did to Iraq. I.e. if it was clear someone was planning to invade, Iran could in fact go for broke and try to defend itself. Since the US right wing and the government of Israel would very much like to see Iran invaded and its government overthrown, and its legs broken, this nuclear latency or the Japan option is an annoyance they would like to remove. It is easier to execute someone if you disarm him first. But Iran of course is already substantially disarmed, voluntarily. What is going on now is an attempt to pull the wool over people’s eyes about that and to con them into spending $6 trillion on another ruinous Middle East conflict. That will keep everybody busy while Netanyahu finally succeeds in ethnically cleansing what is left of the Palestinians, his ulterior ultimate goal. Juan Cole is the founder and chief editor of Informed Comment and Richard P. Mitchell Professor of History at the University of Michigan.